The kitchen is arguably the hub of the home, it is not only the room in which many households eat, it is an area in which people can entertain, cook and socialise. 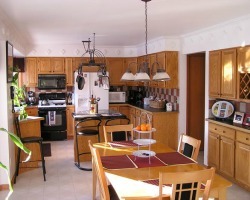 Having all appliances within the kitchen working is therefore important for many people. Whilst you are able to insure every appliance within your kitchen under individual insurance policies, this can be costly and time consuming, with lots of paperwork. You may want to therefore consider an insurance policy that will cover multiple kitchen appliances under one policy. Extras can also often be included in these policies. This can be appliances such as blenders, bread makers, coffee makers, deep fat fryers, food mixers, food processors, grilling machines, steamers, halogen ovens, slow cookers, smoothie makers, juicers, kettles, microwave ovens, mini ovens, sandwich makers, tea makers, toasters, chip fryers, coffee machines and vacuum cleaners. By having a multiple kitchen appliance insurance policy, you can find it easier to keep on top of the policy documentation and it to be, in some circumstances, cheaper than insuring appliances separately.